The Squickerwonkers' most slothful sinner takes center stage in this second volume of The Squickerwonkers Series. Lorna the Lazy hasn’t the energy for anything, and when it comes to her “end”, that will mean everything. Enter at your own risk and listen to another outrageous and dark demise tale with your favorite group of misfit, vice-ridden marionettes. Narrated by author and actress Evangeline Lilly, The Demise of Lorna the Lazy will delight with its fully produced sound effects, soundtrack, and voices. Children will be absorbed and parents will be delighted in equal measure. The Success of Evangeline the Talented! This woman is so infinitely creative.I love the stories,the voices and the lessons in her books.Always look forward to whatever she does next.In her acting or writing she is eternally fascinating. 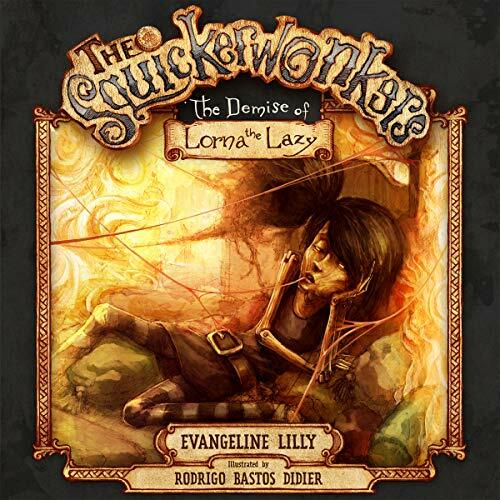 Evangeline Lilly knocks it out of the park again with a highly entertaining narration of Vol 2 in her ‘The Squickerwonkers’ series, The Demise of Lorna the Lazy! Evangeline pulls out all the stops as she convincingly gets into each one of her characters! Evangeline’s rendition of Lorna is particularly amusing with her exaggerated ‘drawn out’ voice and witty lines. The is the second audio book I’ve purchased from the The Squickerwonker series and they are both outstanding! Can’t wait for Lorna the Lazy to be available in hardcover. Evangeline’s creative, captivating story telling along with the incredible detailed imagery and illustrations make the Squickerwonker series a favorite for children and parents alike! Can’t wait for the adventure to continue!! brilliant ! Lorna is the laziest character ever I shall never chew gum in bed again !